With half of the world now living in urban areas, there is an even greater need for green spaces to act as a buffer against ill-health and social isolation. Half of the world’s people now live in urban areas. This creates competition for resources and increases pressure on already limited green space. Many urban areas are still experiencing active degradation or removal of green space. To reverse this trend and ensure the multiple benefits of green space are realised, we urgently need to move toward on-ground action. However, there is no clear guidance on how to translate the evidence base on green space into action. There is limited information to guide green-space practitioners on how much is “green enough”, or on how to manage and maintain green space. There is also a lack of guidance on how to deliver the multiple benefits of green space with finite resources. A recent World Health Organisation (WHO) report aims to provide guidance on how to tackle the uncertainties of providing such spaces. There is a substantial evidence base to show that green space is good for us. It is associated with many health benefits, both physical and mental – including reductions in illness and deaths, stress and obesity – and a range of positive social, environmental and equity outcomes. As worrying trends in mental ill-health, obesity, social isolation, health inequalities and environmental degradation grow globally, there is a pressing need to implement equitable solutions – and green space has a key role to play in this. Providing adequate green space within our urban areas is therefore paramount. We need to preserve, enhance and promote existing green spaces and create new spaces. Various political frameworks underscore the need for these spaces in our cities. For example, the New Urban Agenda calls for an increase in safe, inclusive, accessible, green and quality public spaces. The 2030 Agenda for Sustainable Development pledges to: “… provide universal access to safe, inclusive and accessible, green and public spaces, in particular, for women and children, older persons and persons with disabilities”. The WHO report carried out a systematic review of the published evidence on green-space interventions. The review found a variety of intervention types have strong evidence for delivering a range of health, social and environmental outcomes. These intervention types range from smaller green spaces, such as street trees and community gardens, to larger, more interlinked spaces, such as parks and greenways. This signals the need to think beyond the traditional urban park when considering how to meet the demand for green space among growing urban populations. Another finding of the review was that urban green-space interventions seem to be most effective when a physical improvement of the space is coupled with social engagement. This highlights the importance of understanding the intervention’s target audience. Sufficient time and resources must be devoted to engaging with this audience. This should happen both during the design and implementation phases and when the intervention is completed – and promoted. The WHO report compiled case studies of urban green-space interventions from across Europe, and documented the common lessons from these. This unearthed a range of findings. 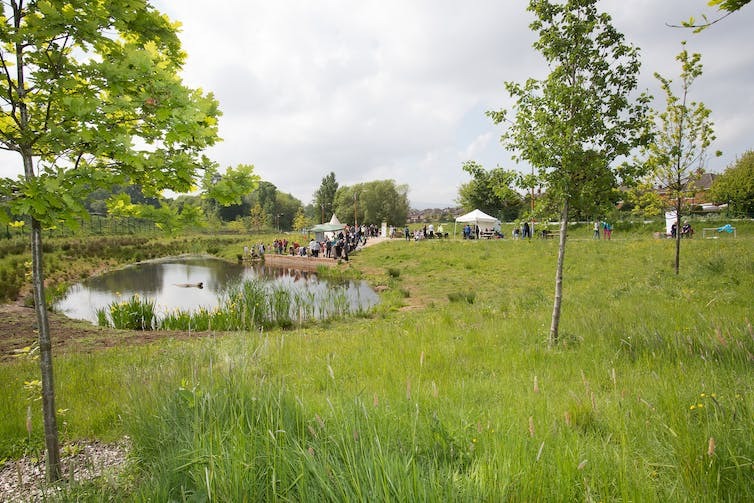 For example, fostering multidisciplinary and cross-sectoral collaborations during planning, implementation and evaluation is a key factor in creating a successful green space. Another key finding was the importance of understanding that urban green-space interventions are long-term investments. They therefore need to be integrated within local development strategies and frameworks – such as urban masterplans, transport policies and sustainability and biodiversity strategies. An example of an urban green-space intervention that showcases good practice, and which features as a case study in the WHO report, is the Connswater Community Greenway in Northern Ireland. This project adopted a bottom-up approach and emphasised community engagement. A full-time community support officer was employed. Having public engagement embedded from the start ensured the local community’s needs were well understood. The intervention’s design was responding to these identified needs. Coupling this local understanding with the latest thinking on good practice led to an evidence-based design that was fit-for-purpose in the local context. The project was also understood to be a long-term investment. A 40-year management and maintenance plan for the greenway was developed from the outset. The WHO report represents an important step forward. As worrying trends in mental ill-health, obesity, social isolation, health inequalities and environmental degradation grow globally, there is a pressing need to implement equitable solutions – and green space has a key role to play in this. Urban green-space interventions can deliver health, social and environmental benefits for all population groups – particularly among lower socioeconomic status groups. There are very few – if any – other public health interventions that can achieve all of this. Anne Cleary is Nature and Health PhD Candidate at Griffith University and Ruth Hunter is Lecturer, School of Medicine, Dentistry and Biomedical Sciences at Queen’s University Belfast. This article was originally published on The Conversation.